As Canada opens its doors to those fleeing war-torn countries, and particularly those entering from Syria in large numbers in coming months, Ontario schools have a unique and important role in welcoming newcomer students and families as part of a whole community response. Fortunately, our province has much experience in supporting immigrant and refugee children at school, and we can draw on proven practices and resources. 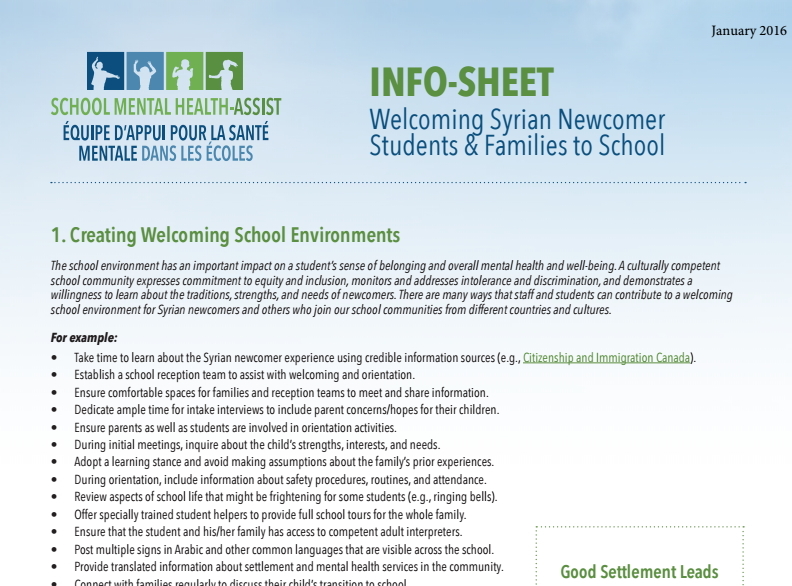 This Info-Sheet from School Mental Health ASSIST is designed to provide introductory information for educators in supporting the mental health and well-being of newcomer students. This will be a reminder for some, but may be new information for those working in schools that are less accustomed to welcoming immigrant and refugee families. The resource is organized to support a planful, whole school approach that recognizes that (1) good settlement experiences are essential for good mental health, (2) newcomers from war-torn countries are typically resilient and possess many intrinsic strengths that they can draw upon as they transition to their new life in Canada, and (3) in spite of best efforts, some students will experience mental health difficulties, so we need to be ready to notice the signs and to ensure seamless pathways to specialized support in the school board and community. All school staff and students have a role to play in helping newcomers to feel welcome and supported. If you have questions about the mental health and well-being of Syrian newcomer students, or other related issues, please contact the Mental Health Leader in your school board who can direct you towards information or services in your community. For more general enquiries or suggestions, please feel free to contact School Mental Health ASSIST directly. 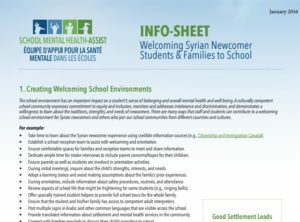 This Info-Sheet was prepared in consultation with members of the newly formed School Mental Health Newcomer Resource Group, and the School Mental Health Newcomer Advisory Network, working alongside School Mental Health ASSIST to support the Syrian newcomer response in the area of mental health and well-being.